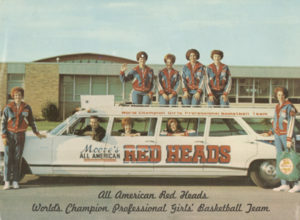 The All American Red Heads played for 50 years from 1936-1986, which is still the longest running women’s professional team. The Red Heads were founded by Mr. & Mrs. C.M. Olson in Cassville, Missouri. C.M. Olson was the former coach/owner of a male exhibition basketball team called Olson’s Terrible Swedes. Known for their on-court antics, this inspired C.M. Olson’s wife, Doyle, and the women who worked in her beauty salons to form a women’s professional exhibition team. In 1954, Coach Orwell Moore and his wife Lorene “Butch” Moore bought the Red heads and moved the team to Caraway, Arkansas. Lorene Moore played on the team for eleven years, scoring 35,426 points during her career. The Red Heads were so popular that during the years 1964-1971 there may have been as many as three Red Head teams traveling the country. In 1972, the Red Heads won 500 out of 642 games played against men’s team. Throughout the years the All American Red Heads played in all 50 states as well as Mexico, Canada, and the Philippines. 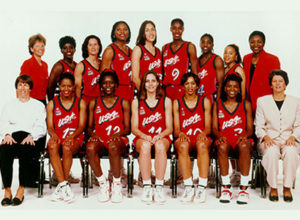 The team has been featured in national magazines such as Life, Look, Sports Illustrated and Women’s Sports, and they were widely considered as the greatest women’s basketball team in the world. Coach Moore retired and disbanded the Red Heads in 1986 after 50 years of play The All American Red Heads still have annual reunions today. 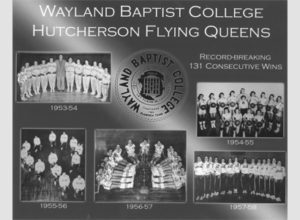 Hutcherson, a Wayland graduate and owner of Hutcherson Air Service, provided air transportation for the Queens to games in Mexico in 1948. That encounter blossomed into a full sponsorship of the team in 1950, a change that brought with it a new mascot – the Hutcherson Flying Queens. Five decades later, Wayland is still atop the world of women’s basketball for they still remain the only women’s team in history to win 1,300 games. Long before Connecticut became a dominant power in women’s basketball, the Flying Queens of Wayland Baptist thrived on innovation, talent and glamour, playing on athletic scholarships, traveling by private planes, warming up with ostentatious drills learned from the Harlem Globetrotters and winning every game for nearly five seasons. The Wayland Baptist University women’s team achieved a 131-game winning streak from November of 1953 to March of 1958 before losing 46-42 to Nashville Business School. 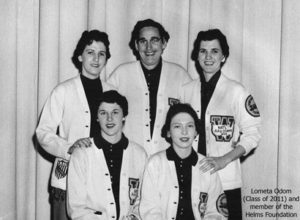 During that time the Flying Queens captured four consecutive AAU national championships. The 1972-74 Mighty Macs team captured the first three Assoication for Intercollegiate Athletics for Women (AIAW) championships. Immaculata is considered the birthplace of modern college women’s basketball. In addition, to winning the first three college national championships, the Mighty Macs were the first women’s team along with the University of Maryland to appear on National television. 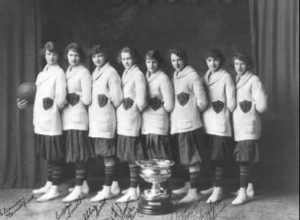 They were also the first women’s team, along with Queen’s College, to play at Madison Square Garden. Their inspirational story was made into a feature-length theatrical movie called The Mighty Macs and released by Sony Pictures in 2011. 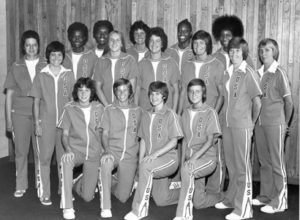 The 1972-74 teams have produced 3 Women’s Basketball Hall of Fame Inductees. 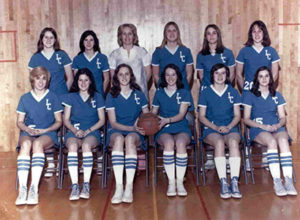 Listed are the individuals associated with the three teams; Janet Ruch Boltz, Denise Conway Crawford, Janet Young Eline, Theresa Shank Grentz (Class of 2001), Barbara Deuble Kelly, Tina Krah, Patricia Mulhern Loughran, Judy Marra Martelli, Sue Forsyth O’Grady, Rene Muth Portland, Betty Ann Hoffman Quinn, Cathy Rush (Class of 2000), Mary Scharff, Marianne Crawford Stanley (Class of 2002), Maureen Stuhlman, and Marie Liguori Williams. The 1975, 1976, 1977 Delta State teams captured three consecutive AIAW championships. 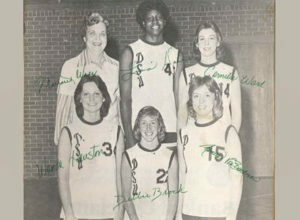 After finishing 16-2 in the 1973-74 revival season following a 40-year layoff of the women’s basketball program, Delta State proceeded to end Immaculata College’s three-year AIAW national championship reign in season No. 2 by going undefeated at 28-0. Delta State followed its first AIAW national crown by also winning the next two as the Lady Statesmen defeated Immaculata (69-64) at Penn State and then LSU (68-55) at Minnesota. During their three championship years, Delta State compiled a 93-4 record (28-0, 33-1, 32-3), including a then-record 51 straight wins. The 1975-77 teams have produced 2 Women’s Basketball Hall of Fame inductees, Margaret Wade and Lusia Harris Stewart. The WBCA Wade Trophy, considered the Heisman of women’s basketball, is named in honor of Lily Margaret Wade. Listed are the individuals associated with the three teams: Angel Fortenberry, Ann Logue, Beth Trussell, Cornelia Ward, Debbie Brock, Jackie Caston, Janie Evans, Jill Rhodes, Judy Davis, Kathy Lewis, Key Crump, Laurie Ann Harper, Lusia Harris Stewart (Class of 1999), Lynn Adubato, Mandy Fortenberyy, Margaret Wade (Class of 1999), Mary Logue, Melissa Thames, Melissa Ward, Mimi Williams, Pam Piazza, Romona Von Boeckman, Sheri Haynes, Tish Fahey, Virginia Shackelford, and Wanda Hairston. The Women’s Professional Basketball League (WBL) was the first professional women’s basketball league in the United States. 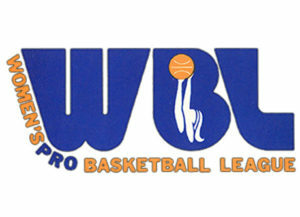 The WBL lasted three seasons from 1978 to 1981. The league was created by sports promoter Bill Byrne and feature eight teams during its inaugural season. The league played its first game on December 9, 1978, between the Chicago Hustle and the Milwaukee Does at the Milwaukee Arena in front of 7,824 fans. The Houston Angels were the league champions during the inaugural season in 1979, while the New York Stars and the Nebraska Wranglers won the next two league championships in 1980 and 1981 respectively. Rita Easterling won MVP honors during the first season (1978-79), Molly Bolin and Ann Meyers were co-MVPs the second year (1979-80), and Rosie Walker claimed the MVP honors during the final season (1980-81). Many notable Women’s Basketball Hall of Fame inductees were associated with the WBL including Carol Blazejowski, Cindy Brogdon, Nancy Dunkle, Peggie Gillom-Granderson, Lusia Harris Stewart, Tara Heiss, Nancy Lieberman, Muffet McGraw, Ann Meyers Drysdale, Pearl Moore, Inge Nissen, Patricia Roberts, Uljana Semjonova, Rosie Walker, and Holly Warlick.